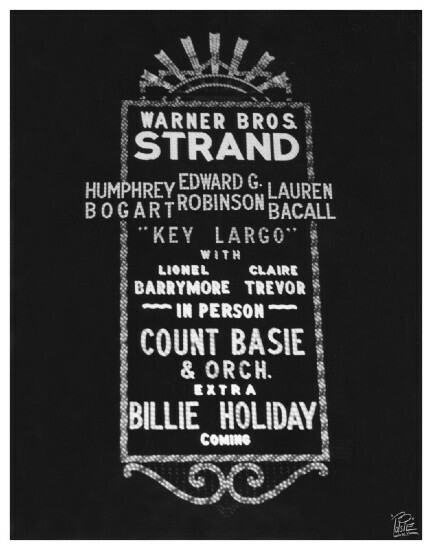 For the debut of the new film Key Largo — starring Humphrey Bogart and Lauren Bacall — the exhibitors at the Warner Strand Theater (at Broadway and 47th Street) has a special treat in store. The Strand Theatre, which opened in 1914, has already made history a few times in New York. Considered the first theater built exclusively for motion picture exhibition, the Strand was the first New York job of Samuel ‘Roxy’ Rothefel (who would move on to his own Roxy Theatre and, then Radio City Music Hall). On July 6, 1928, The Lights of New York, the first all-talking feature in history, premiered at the Strand. In 1948 came the fourth (and what would be final) movie collaboration between Bogart and Bacall, and its debut on July 16th deserved something out of the ordinary. 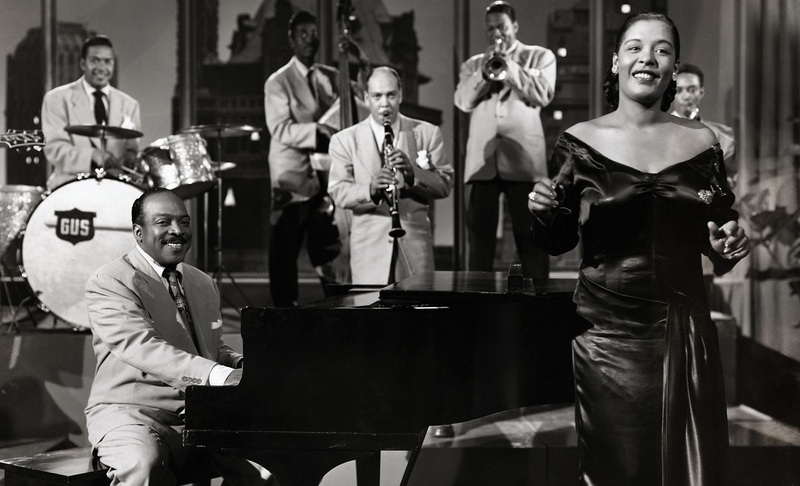 For six weeks, the Strand presented the film on an exhaustive bill of music and comedy, featuring two of the biggest stars in jazz music, Count Basie and Billie Holiday. The two greats had recorded and toured with one another a decade previously, but much had changed since then. Holiday had only been released from prison that March, serving time on a charge of heroin possession. The big band era was ending, leaving Basie struggling to mold his music to the new styles of bebop, rock and rhythm and blues. 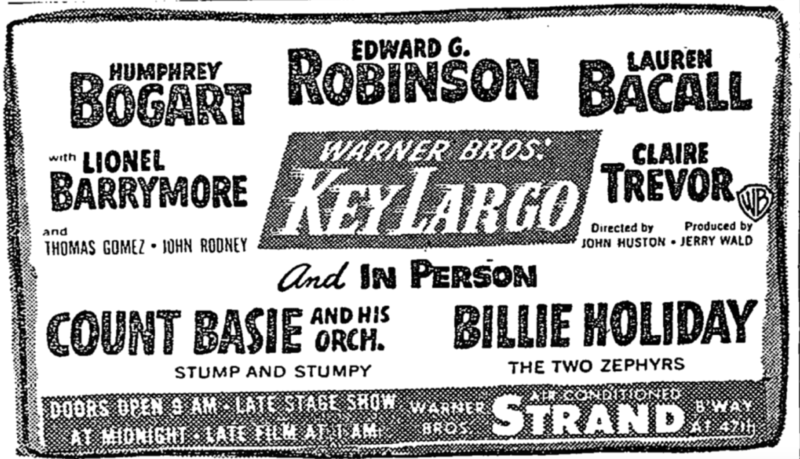 While both would continue with their celebrated careers into the 1950s, the six-week Key Largo stint would remind many of earlier, more jubilant phases of their careers. 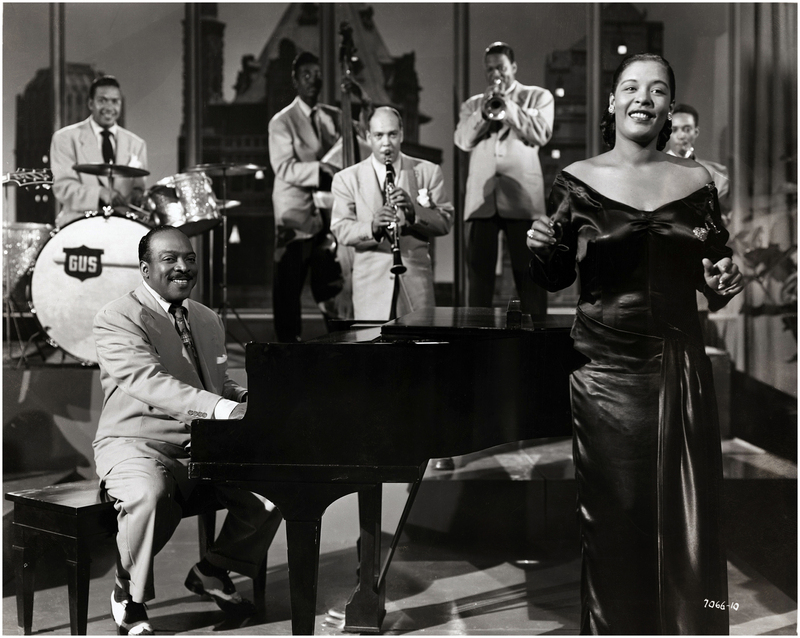 It was the longest theater run of Lady Day’s career although she fretted the fact that many were there to see her “get all fouled up,” according to author Donald Clarke. They were joined by the black comedy team The Two Zephyrs (with legendary comic Slappy White) and tap dancing duo Stump and Stumpy. I hope that Billie sang “Moanin’ Low,” made famous by the film in a mesmerizing performance by Claire Trevor (who won the Academy Award). ← The Bowery Boys blog — upgrade underway!